Last summer was the most humid, record-breaking summer Connecticut residents have ever seen, and this upcoming summer promises to be a scorcher!! While you’re trying to beat the heat at Seaside Park or picnicking at Pleasure Beach, don’t forget about your rental property! Real Property Management Southern Connecticut is the rental property management Bridgeport landlords trust to keep their rental home cool and comfortable during the summer heat. Here are some summer maintenance tips we recommend performing before it gets too hot. If you have ceiling fans in any or all of your rooms, make sure they all function properly and give them a good dusting while you’re at it. Fans are imperative when trying to circulate cool air in the home, especially when the humidity is at its worst. Tighten the screws and ask your tenants if they’ve noticed any problems. Replace ceiling fans if they’re super old and just not getting the job done. There are summer days when your tenant might want to take advantage of a cool breeze, and it’s hard to do that if the windows are stuck! Make sure all windows in the rental home open and close properly, and check that any window screens are secured. Windows should be properly sealed so that if the A/C is on, no cool air escapes. Smart rental property management in Bridgeport means replacing your A/C filters on a consistent basis to improve air flow quality and reduce dust and allergens. If you’re like most landlords, you probably don’t know a whole lot about air conditioning units or swamp coolers, so call out a professional to make sure they’re working properly. A broken A/C unit in the sizzling summer heat means hot, sweaty and angry tenants. You definitely don’t want that! While checking the cooling systems, also look at other electrical features for damage to avoid fire hazards or potential problems. These parts often get neglected, so don’t forget to inspect them before the summer heat wave. Dryer vents can get clogged, so take the time to vacuum them out. If there’s a furnace filter, change it out to have it ready to go for the next season. Take a good look at the water hoses on the washing machine and fridge to prevent leaks. Last year, Connecticut experienced the 14th wettest July with 135 percent of normal precipitation, according to the Northeast Regional Climate Center. Don’t let your rental home get drenched in the downpour! Check all the gutters around the outside of the house to make sure they’re draining away from the foundation of your home. Wash the windows of the home inside and out, and check the wood for damage or rot along the siding. Call a professional to inspect the roof for leaks and damage, as you don’t want any summer rain coming in through the ceiling. We all avoid that house in the neighborhood with overgrown weeds and tall grass. Keep your rental property landscaping in check so this isn’t you! Besides just looking terrible, weeds can also grow beneath concrete surfaces and cause damage to homes. Be sure there are no weeds growing on walls, A/C units, or power lines. Getting weeds tangled in electrical appliances can cause extensive problems. Have the tenant mow the lawn regularly or mow it yourself, and add fertilizer and weed killer when necessary. During the summer months, it’s especially important to water the lawn if there’s no drought in effect, so if you don’t have a sprinkler system, set up a weekly or bi-weekly watering plan with your tenant so they know when to water and when not to. 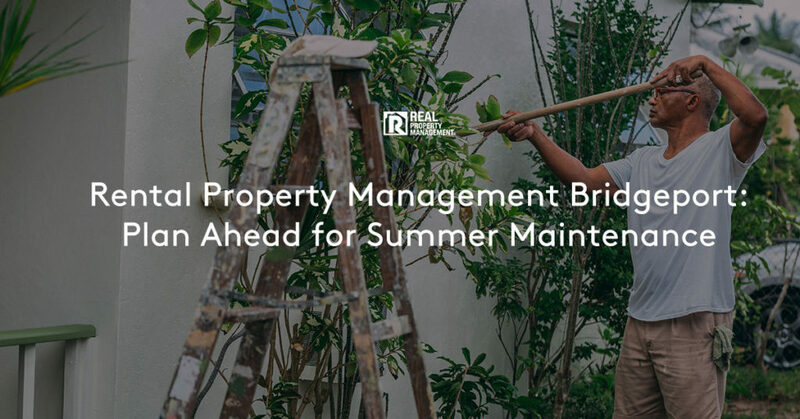 A summer maintenance tip rental property management Bridgeport landlords should also remember is to keep trees and bushes trimmed and pruned. Since this sometimes involves power tools, if you don’t want to do it yourself or don’t trust your tenant to do it, you can hire a landscaping or tree service company that has the experience, licenses and insurance to get the job done right. It’s smart to have some type of pest control company come out to your rental property during the summer months, since this is the time that most bugs are active. Keep mosquitoes, termites, cockroaches, and ants away from your rental home and your tenants. Check that there are no tears in the window screens or gaps in door frames that allow bugs to invade the property. Prevent long-term pest problems and keep tenants happy by keeping insects OUT! At Real Property Management Southern Connecticut, we believe that preventative maintenance will maintain the quality of your property and also save you time and money in the long run. We are the rental property management Bridgeport landlords trust to help them avoid expensive maintenance fixes and keep tenants happy. “I’ve used RPM for over a year and they are top notch. They are extremely responsive and do a fantastic job handling any issues. I would highly recommend them to manage any properties for new landlords. Thanks RPM!” -Better Business Bureau Review from bill r.
Let us market and advertise your property, screen potential tenants, deal with rent collection, perform regular property inspections and money-saving maintenance, and take the hassle out of owning a rental property! Give us a call today to put us to work for you!